Especially if they’ve come from authors whose writing you respect and enjoy. 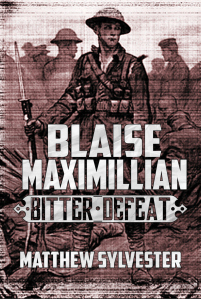 In this case, David Guymer, author of the excellent City of the Damned (Gotrek & Felix Novels) has given Blaise Maximillian: Bitter Defeat it’s 3rd FIVE STAR review! Bitter Defeat is a series of connected short stories telling the story of an alternate World War 1 in which the result (as you might figure from the title) is very different to that which took place in our universe. What grabbed me from the off is that Sylvester really seems to understand what it means to be a soldier in a warzone. Whether it’s clearing a German trench, taking an artillery barrage, fighting for his life while half-blinded and suffocated by his gas mask, every chapter of Blaise’s war-time experience is brilliantly and believably told. Even once the Germans start to turn some frankly awesome dieselpunk weaponry onto the trenches of Northern Europe, these are worked seamlessly into the fabric of WW1 as we know it and the end result is believable and brutal. I love it, and I’d highly recommend it. If you’ve been wondering about whether to buy the book, surely this recommendation will make the decision for you!